Above: A number of narrow storefronts front the sidewalk at 1004 Marquette Avenue. A plan to demolish one of the last surviving clusters of sidewalk storefronts in downtown Minneapolis offers an important lesson in the tricky economics of some old buildings. The century-old property at 1004 Marquette Avenue will likely meet the wrecking ball soon, 15 years after a court said it could not be historically designated -- unlike its neigbor the Handicraft Guild building. But while some may miss its small-scale charm amid downtown towers, the building's unique size and location actually made it particularly burdensome for owners Pratt Ordway. That's in part because the downtown land underneath the building is much more valuable than the structure itself, creating a relatively high tax burden on a lower-rent building. The latest assessment -- intended to estimate the property's resale value -- valued the land at $2 million, while the building clocked in at just $1,000. Total taxes and assessments are approximately $111,000 in 2015. Firm principal John Ordway said rent does not cover the taxes, insurance and mortgage payments on the building. "It gives you some idea of the economics. Something’s got to give," Ordway said. That's before even considering the building's needed repairs after many years of deferred maintenance, which Ordway pegged at about $5 million. Bringing it up to code would require installing elevators, sprinklers, new plumbing and electrical systems, as well as insulating the walls and repairing a leaky roof, he said. 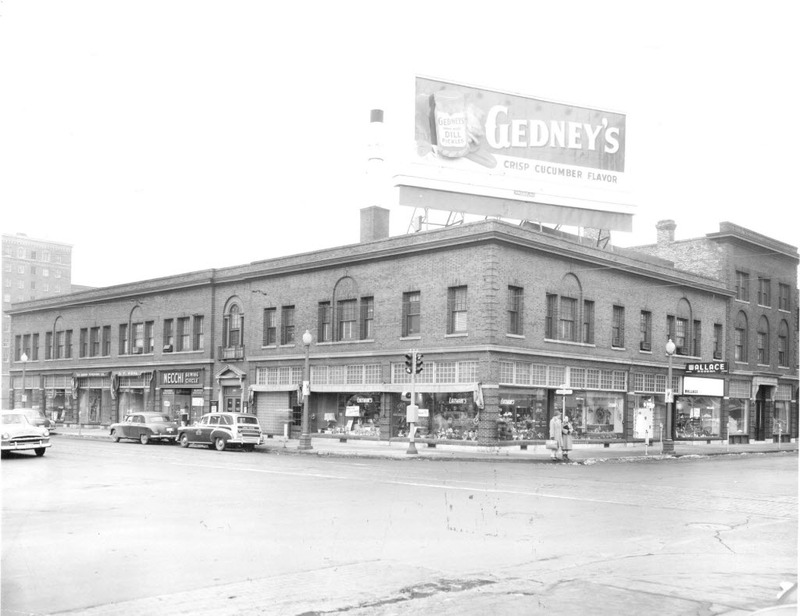 Above: 1004 Marquette in 1955. His firm, which specializes in suburban commercial real estate, owns 1004 Marquette and the adjacent Handicraft building somewhat by accident. The buildings were initially expected to be restored as part of a massive condominium tower project next door on Nicollet Mall. But that deal soured and Pratt Ordway was left several years ago with several connected properties, one of which was later sold to Target for their new employee lounge. Then Ordway's firm worked with United Properties to explore the possibility of converting the Marquette property into a boutique hotel and adding an extra floor. In the current plan, the proposed 18-story apartment tower on the site of 1004 Marquette will help pay the bills to rehab the Handicraft Guild building. Ordway explained that he could never have charged sufficient rents in the existing buildings alone to cover the repairs. The size of the building is another important consideration. Development consultant James McComb, who has been in the business for 40 years, said historic buildings that get redeveloped are generally large enough to generate a lot of new revenue. "With a two-story building, you don’t have enough building area to create value to support the land cost," McComb said. In a statement about 1004 Marquette last month, local preservation group Preserve Minneapolis said they "encourage the city to revise its land-use and taxation policy to make it more attractive to developers to adaptively use existing historic buildings." Architect Phillip Koski, a Preserve Minneapolis board member, said it is especially needed for buildings that don’t qualify as “significant” under the city’s preservation criteria. “Washington didn’t sleep here. It wasn’t designed by Cass Gilbert…but it still gives you a sense of the scale of that part of downtown,” Koski said of the Marquette property. Council Member Lisa Goodman noted that the state regulates how property is taxed. She successfuly pushed early in her tenure for a prohibition on demolishing buildings to create surface parking lots, but said the city's options are limited. "What would be a policy that we could put in place that would have prevented a building that ... the [court] told us we couldn't designate, what policy could be in place to force someone to keep that?" Goodman asked. Regarding incentives, Goodman also observed that Minnesota already offers state tax credits for historic preservation -- on top of the federal tax credit. Buildings must be listed on the national register or part of a historic district to qualify (a judge has already ruled against such a designation for 1004 Marquette). There are some incentives in Minneapolis' code. The city's website features a tax abatement policy for the rehabilitation of historically designated properties, but city planning manager Jason Wittenberg did not believe it had ever been used. The city grants zoning code and parking flexibility for rehabbing old buildings. It also allows historic building owners to transfer or sell their unused density points to another project downtown, though this tool has also never been used. Other parts of the country have tried to tackle the issue. Cook County, home to Chicago, offers a 12-year property tax reduction for owners rehabbing historic buildings. California -- which does not have a historic tax credit -- allows cities to temporarily reduce property taxes for historically listed properties. Boulder, Colorado will waive the city's sales tax on construction materials for historic rehabs. 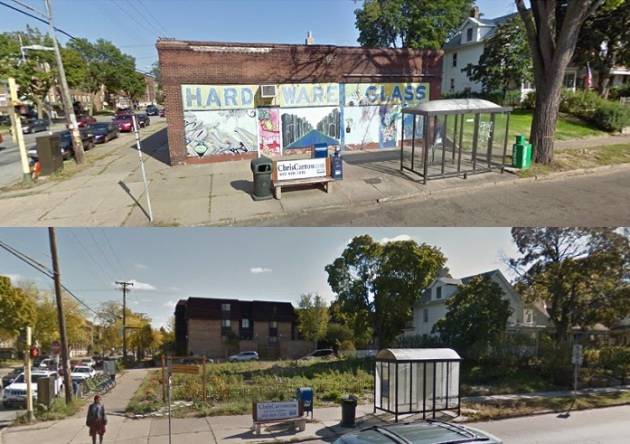 Above: Before and after views (2009 and 2014) of the former Rex Hardware building on 26th Street and Lyndale Avenue. Smaller buildings in densely zoned areas are particularly vulnerable, since owners are more motivated to demolish for a larger building, said Linda Mack, a member of the city's heritage preservation commission. She highlighted the case of Rex Hardware, a small-scale 1914 building on 26th Street and Lyndale Avenue that was demolished in 2011 for housing that ultimately never materialized. Mack said a public or private revolving loan fund could incentivize owners to instead maintain those historic properties. "There’s always the 'demolition by neglect' accusation. Usually it’s true. But on the other hand there can be reasons why owners do that – it’s not a viable property," said Mack, a former Star Tribune reporter. "Preservation is interesting…because it can bring into conflict very high-minded community values and the economics of trying to make a go of a business and a property."